EVERETT, Wash., Aug. 29, 2014 -- Boeing (NYSE: BA) and Xiamen Airlines today celebrated the delivery of the airline's first 787 Dreamliner. Pictured here is the airline's 787-8 on an earlier test flight. EVERETT, Wash., Aug. 29, 2014 /PRNewswire/ -- Boeing (NYSE: BA) and Xiamen Airlines today celebrated the delivery of the airline's first 787 Dreamliner. "We are excited to receive our first 787 Dreamliner which is also the first widebody airplane of our all-Boeing fleet," said Che Shanglun, president and chairman of Xiamen Airlines. "With the innovative technology and exceptional efficiency, the 787 Dreamliner will be key to our further growth and international expansion." With today's delivery of its first 787-8, Xiamen Airlines becomes the third Chinese airline to operate the 787. The airline will use the 787 on long-haul routes from its Fujian province base to Europe, North America and Australia. Formed in 1984 as China's first joint venture between the Civil Aviation Administration of China (CAAC) and a municipal government, Xiamen Airlines started services in 1985 with two 737-200s serving three cities. The carrier has grown into China's sixth largest airline serving 218 domestic routes and 26 international and regional routes. 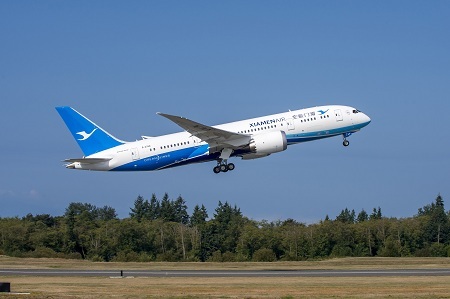 "Xiamen Airlines is a valued Boeing customer and we are delighted to celebrate the airline's 30th anniversary with its first 787 Dreamliner," said Ihssane Mounir, senior vice president of Northeast Asia Sales, Boeing Commercial Airplanes. "We look forward to strengthening our partnership with Xiamen as the airline continues to expand its global long-haul fleet." As part of Xiamen Airlines' 12th five-year plan ending 2015, the carrier plans to grow its fleet to 150 airplanes, including six 787s. The 787 is the most advanced airplane in commercial aviation and will help Xiamen Airlines develop more point-to-point routes globally, while also establishing the airline as an emerging force in the commercial aviation market. To support Xiamen Airlines' 787, Boeing will provide a comprehensive suite of support and services that includes flight training, Airplane Health Management, electronic charts and navigation data, and Maintenance Performance Toolbox through its Commercial Aviation Services business. Xiamen Airlines is China's only all-Boeing carrier. In November 2013, the airline took delivery of its 100th Boeing airplane, a Next-Generation 737-800. Xiamen Airlines has a total of six 787s on order.